the wedding album I made for my sister's friend. and the bride and groom absolutely loved it. 20 pages for Angela and Dave. Their colors were Champagne and Navy. Their taste was simple and not too fancy. So this album hopefully showcases their photos beautifully and elegantly. Thanks so much for sharing in their special day as well as my anniversary! Pin It We (FCCB) are so excited to introduce you to our vinyl education week that will be in the month of September. You will have to opportunity to learn something new each day on how to use various types of vinyl, and of course the vinyl will be cut using a Cricut machine, we'll teach you how. 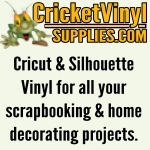 I want to introduce you to Cricket Vinyl Supplies.com, they will be our sponsor for the week, and have been so generous with providing the design team with vinyl for our challenge. To give you a heads up our challenge will be Fun with vinyl. Use vinyl that has been cut using your cricut machine on your project. If you don't have vinyl no worries, or would you like to get vinyl at a discounted price... that is where our amazing sponsor comes in, they will give you a discount on vinyl so you can get some ordered in time to participate in our challenge with us. Would you like to win a Cricut Expressions Machine? If we get 100 participants in the challenge our sponsor will give away a cricut machine how awesome is that! Your project must be posted on your blog on Sept 9th or after. Included is a Cricut Expression Machine, deep cut blade, Jasmine Cricut cartridge, ten 12"x 12" assorted sheets of matte vinyl, and one 12"x 12" gridded transfer tape. We need your help to spread the word about our FCCB Vinyl University, please post this button on your blog side bar, just copy the code to add it to your blog. Share this information with your friends, on your blogs, your favorite message boards and any where else you can think of. This is going to be an awesome week! I hope that you will come and play with us September 9th!!! A Very Exciting Wednesdays Winners!!! I did it! We did it!! So here is how it is going to work....Every single one of my followers is eligible to win. Even if they did none of the extra things I asked. I have currently 404 followers. The winner has one week to claim their prize and then I pick a runner up. So hope you are all watching!! Now all those extra ladies who shouted my name all around scrapbook kingdom and then some and added me to your blogs well you are going to get entries for every extra thing you did. Don't you worry!! I am totaling them up now. I received a grand total of 47 Shout Outs from these gals!! Woohoo! Thanks ladies! And I will also be pulling a separate winner from those of you that were running around cheering for me. Because without spreading the word, my blog would never grow. I want to send you a little thank you gift for supporting me. I appreciate all you do for me!! So let's do this!!!! So excited!!! I started with my Followers and then added the 47 shout outs to equal 451 entries. 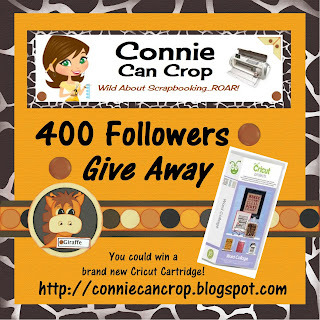 You are the winner of the Cricut Cartridge!! You are the winner of some goodies from me just because I appreciate your support. We invite you to create a project using your Cricut that features your favorite way to beat the heat. I created a two page layout of my boys swimming and goofing around with their younger cousin Collin!! This pics were perfect for what I had in mind. The Paper line I chose was Fancy Pants Beach Babe so there was a lot of pink in it. Just don't that to the boys! LOL! My borders were created using borders by Kiwi Lane Designs. Gotta say I just love them! I used the Brackets and Madison Border Patterns on this Layout. All my Cricut cut were made with Crocs Rule Lite Cartridge! It is super cute!! This little matey is called "swim" and I cut him at a height of 3.5" and he is 4 layers. Here we have "swimsuit" and he is a bit shy. Has to wear a body suit!! He is also cut at 3.5" and has 4 layers. Now my title Wild Summer is two different welded cuts and cut at 2" super easy to do. It too has 4 layers. This last fellow or fella is "pool" and he is at 3.7". Now his swimming pool was much larger than this but I really didn't need it that big and wasting so much room so I trimmed it down to fit above my photo. Wednesday I will be announcing the 400 follower winner!!! Today we invite you on our Suburban Safari with this great group of crafters who will be showcasing cards, layouts, or projects all about the creatures of the jungle. Join us on an adventure full of growls, grunts, squeaks and squawks! LISA is the first stop on this fun Blog Hop. This is a one day blog hop and we appreciate your leaving a comment to encourage all these fabulous crafters to continue sharing their ideas and creations. We have several awesome sponsors and giveaways for this hop! These sponsors have been super gracious!! Be sure to check them out!! Are you ready for an amazing adventure? Let's go! For my project I decided to create a zoo themed layout. When I saw this SVG file by Miss Kate Cuttables I knew I had to create it. Her characters are just too cute! Such a fun title! All cardstock! Cutest King of the jungle ever!! This entire layout was created with cardstock from my stash. Some scraps and some AC cardstock. I also used a Zig glue pen and my CM tape. This file by Miss Kate Cuttables can be found here. Thanks so much for stopping by today! I hope you enjoyed your visit as much as I enjoyed having you! Be sure to check out my Challenge of the month and become my follower. Come meet my new friends! We are taking a walk on the Wild Side and I have the cutest furry friends for you to meet!! Here's two of them just for a little teaser!! They are so cute I just can't wait!! LOL! They come from Miss Kate's Cuttables. So be sure you come back tomorrow!! Lots of cool sponsors too! for my Cricut giveaway!! Wohoooo! And just over one week left to enter my challenge!! So many awesome entries! You ladies Rock!! Scrappy hugs! Love ya all! Oh how I miss you all so!! (after my 2 year break due to my wonderful and oh so serious accident). I am taking Biology and Chemistry this semester and trying to still be a good wife, mom, ebay store owner, DT member at FCCB, Storytellersclub and now Lovebug Creations (YAY), and yes trying to keep up with my blog and personal crafting and bloghops. Is anyone tired? Because man after reading that I am!! LOL! So I realize that I haven't posted anything since Sunday. Please bear with me. I have some amazing new sponsors lined up. As well as some awesome new projects for my design teams. I will continue to post monthly challenges and love seeing all your entries. 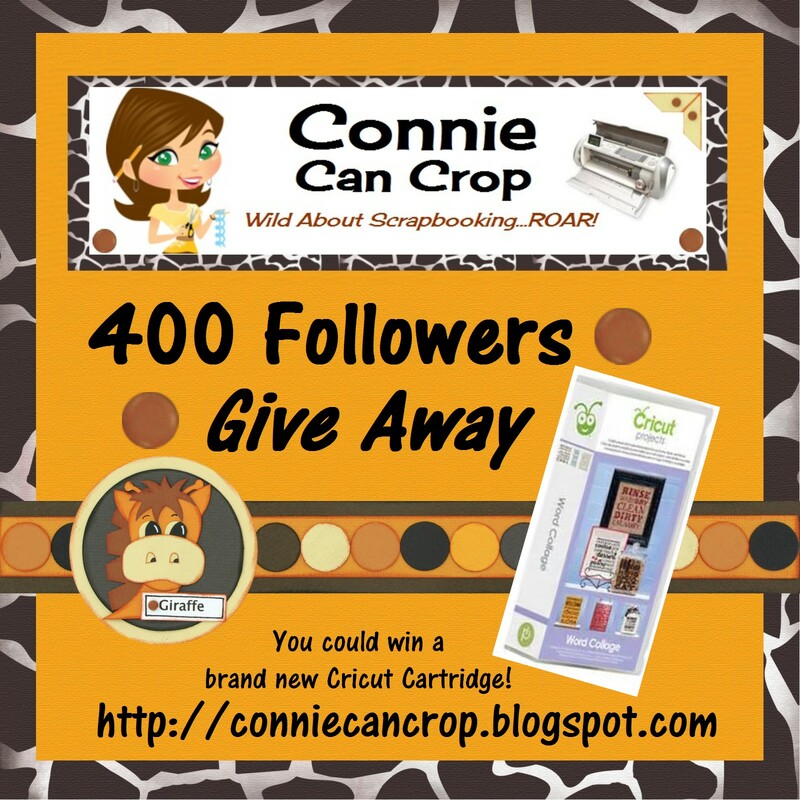 I am so close to giving away that Cricut cartridge!! 4 more!!! Hopefully next week!! I just need to adjust to my new busy and chaotic life! And hope that you will hang in with me for this crazy adventure. As always sending you scrappy hugs!!! Did you enter the challenge over at FCCB this week? You should!! You could win a set of Cri-Kit pens!! Simply link up a project featuring a cricut cut with a cool treat!! Today is the last day to enter!! 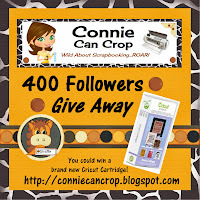 And then there is my Blog Candy giveaway.... only 4 Followers to go!! OMG!!! We are so close!! I can't believe it is happening!!!! Can you? 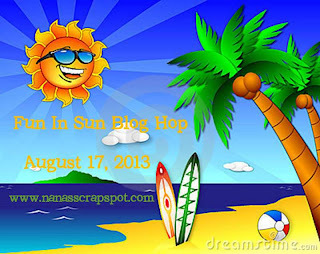 Welcome to “Fun In The Sun” Blog Hop! So glad you can join us! We will be showcasing summer time projects! In addition to seeing some awesome projects, there is some blog candy available too! Scrapping for Less is sponsoring a wonderful prize. A prize of your choosing. 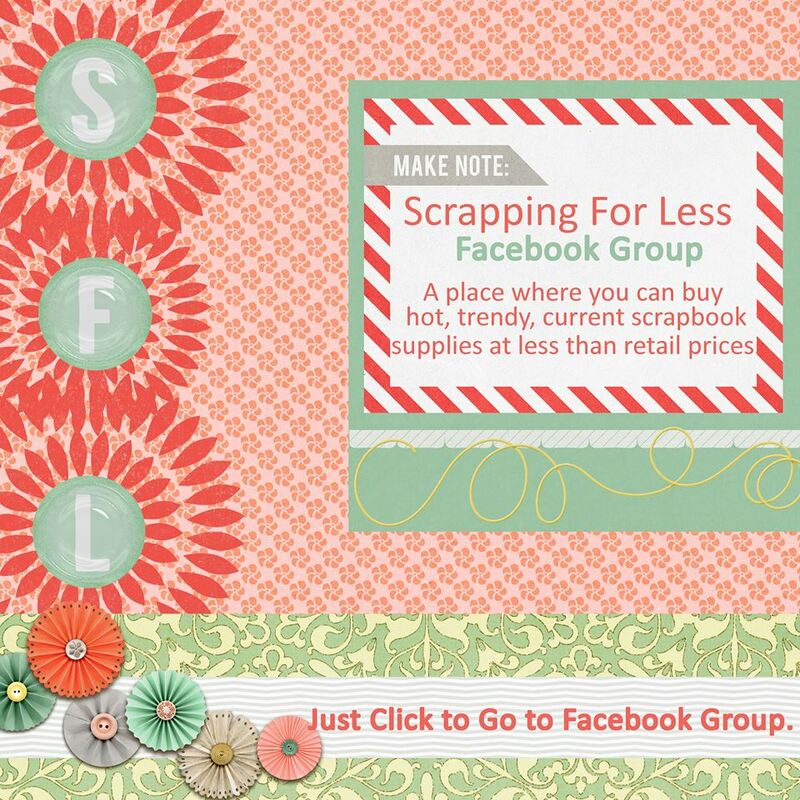 Scrapping for Less is a Facebook Scrapbook Retail store where Teresa Russell sells scrapbook supplies...hot, trendy, current, and brand new to the market supplies at less than retail costs. It is basically a retail/pre-order group where you commit to ordering what is offered up for sale and then invoices are sent just a couple days before the stated order date. There are also typically current "items in stock" available for purchase also. Scrapping for Less is offering a $20 credit to the winner of the hop. You must comment on each stop in order to be eligible to win the credit. Just click on the image below in order to go to group and ask to join. Thanks for hopping with us today. Make sure to leave a comment on each stop because the winner can be chosen from any of the participants blogs! Nothing screams fun in the sun for me more than an awesome cruise on the Pacific Ocean down to Mexico!! So this layout was perfect for this blog hop. I purchased this kit many years ago from a Scrapbook Expo and it has just been sitting on my shelf waiting for that special moment. So what better moment than this hop? I know what you are thinking...why buy a kit like this when I own a Cricut? Well...because I bought this a long time ago. Long before I mastered my Cricut. I know that I could recreate this layout now. And you know maybe I will. So stay tuned...LOL! For now check out these close ups. Lots of hand (faux) stitching. And white twine on the life preserver. Your next stop is LISA!! I am so excited to share the latest and greatest news with you all!!! They have the coolest rumple ribbons and mama mesh around! Be sure to check them out! Here's the link to the store. And here is the link to the blog. You can also find us on Facebook. Catch my first post for them on Monday, September 2nd!! Did you enter the challenge over at FCCB this week? You should!! You could win a set of Cri-Kit pens!! Simply link up a project featuring a cricut cut with a cool treat!! And my Blog Candy giveaway.... only 8 Followers to go!! We had so many awesome friends join us! Thank you to everyone who came out and showed us some love! And special thanks to my friends who showcased their awesome projects and to My Craft Spot for Sponsoring this event. "I have followed each and every one of these and I tell you its amazing what all you brilliant artistic women have shared. Just fun, creative back to school projects that would make any kid or teacher happy! Thanks for all ideas." This week we have a fabulous sponsor at FCCB. So I thought it would be perfect to show you how awesome these pens from Cri-Kits really are. Be sure to enter the challenge at Fantabulous Cricut Challenge Blog for your chance to win some pens. This video comes to us from 217Creations and I think it describes these pens best! And my Blog Candy giveaway.... only 9 Followers to go!! We invite you to create a project using your Cricut that features your favorite cool treat. I am going to send this a friend of mine to see if she'd like to meet for coffee. Frappe's are my favorite so this worked out perfectly!! I used the Cri-Kits Metallic Blue to create this cool design on my card as well as my title. I filled the title in with a gel pen. These pens are so much fun and the ideas are endless. I plan on creating more items this week showcasing these funs pen sets for your Cricut. And my Blog Candy giveaway.... only 10 Followers to go!! Today we invite you to come check out this great group of crafters who will be showcasing cards, layouts, or projects all about school days. My Craft Spot has over 50 stamp and metal die sets. Shipping is free in the U.S. They also have an awesome Gallery Blog that is full of fun projects. Please feel free to show our sponsor some love by visiting the links below! You will have until 9:00 pm Sunday to finish the hop and leave your comments. Winner will be announced on Wednesday. Are you ready to head back to school? Let's go! For my project I decided to create a back to school layout. This is back to school 2 years ago. LOL! I am slowly catching up! Ha! I used border stencils from Kiwi Designs and one of their layouts as a guide. The paper is Basic Grey Oxford line. My title was cut at 3" and the Back pack at 3.5" using the Recess Lite Cricut Cartridge. Love the images on this cute cartridge! Up next is the lovely An'Jenic! !